Lynn has several decks in the works, including a nature-themed tarot deck with award-winning artist Lisa Hunt. She is also writing a Botanical Inspirations deck, which reflects her passion for gardening. 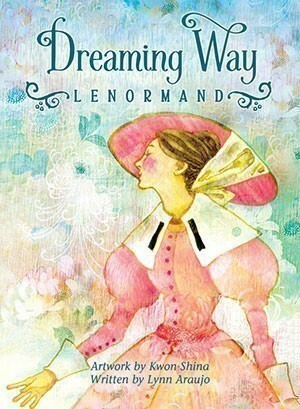 Her Dreaming Way Lenormand deck, with delightful artwork by Kwon Shina, is due out in April. Working with all types of publishers and book companies, we here at Tarot Reflections begun to wonder about all of these different types of people. As well as the things that go into making and creating some of the great decks and books we see. So we decided to go to the source, asking them some questions that we thought well that we would like to know. Some that we thought you might to know. We were lucky enough to have a great response from all of the major tarot publishers and got some awesome interviews because of it. Lynn Araujo is one of such people, she works for US Games Systems, Inc. Taking some time out she filled us in on her take of her view of the publishing world. We appreciate her time and hope you enjoy the interview. TR: Can we have some background on you please? LA: I was raised in the small town of Corning NY. I have three sisters who I am very close with. I graduated from Binghamton University where I was an English and Linguistics double major. My Dad and my oldest sister are scientists but everyone supported my literary interests. After college I desperately wanted to get away from the cold northeast so I went to UC Berkeley for my graduate studies in Linguistics. There had always been a certain mystique about Berkeley for me and I fell in love with the Bay Area’s vibrant cultural energy. As part of my linguistics program I studied Asian languages and received a Fulbright scholarship to do research in Indonesia. I loved living in Java so much I moved back there with my (ex) husband and young son. We ended up spending ten years in Asia—five in Jakarta, where my second son was born, and then five more in Singapore. We were fortunate to be able to travel a great deal to Australia, Hong Kong, India, Japan, Thailand, and other fascinating places. That was 20 years ago but I still love to travel and learn about other cultures. I now have two grown sons, and I live in Connecticut with my partner Mike and our two Australian shepherds. TR: How did you get into publishing? Is this something you've always wanted to do? Any special requirements needed to get into publishing? LA: Before working at U.S. Games Systems, I was an Acquisitions Editor at Greenwood Publishing, an academic publisher. I developed projects in literary criticism, multicultural studies, mythology and women’s studies. I always knew I would be an editor. I love books and I love research. At U.S. Games Systems my job is such a nice balance of writing, editing, working with writers and artists. Publishing is a changing world, but as long as you recognize the shifting currents and embrace them rather than resisting them you can make it work. For example, when I started at U.S. Games there was no social media involvement. So I changed that and now it’s one of my favorite aspects of my job. U.S. Games is also moving toward adding digital books to our product offerings. TR: Do you personally read tarot or oracles? What's your interest level in the products that your company publishes? LA: Over the 11 years I’ve been at U.S. Games I have learned quite a lot about tarot, not just from the books we publish, but from the wonderful people in the tarot community. I almost always have a tarot deck with me when I go to friends’ home or to parties. I explain that I am not really telling their fortunes. I am just helping them explore a situation to gain a new perspective. I admire people who had a very early calling to read tarot. I believe we can all develop our intuition, but some people are truly born with a gift. TR: If you do read tarot, what is your deck of choice? LA: I usually read with the Centennial Smith-Waite deck or the Universal Waite Tarot. I like the subtle colors and rich symbolism. If I am reading for people who are a little nervous about tarot I’ll bring a fun deck like Vanessa Tarot or Paulina Tarot. TR: What is your personal favorite tarot/oracle published by your company? LA: It’s impossible to choose just one because I have had the pleasure of working with and getting to know several amazingly talented artists like Lisa Hunt and Holly Sierra. Discovering what strong, insightful women they are makes me appreciate their decks even more as tools of empowerment. Other artists I enjoy working with are Judy Mastrangelo, Josephine Wall, Jody Bergsma, Kris Waldherr and Paulina Cassidy. I guess I really like pretty decks that combine elements of nature with a bit of magic and whimsy. TR: What is your personal favorite tarot/spiritual book published by your company? LA: We don’t publish that many full-length tarot books. But there are two special tarot decks that begged for more in-depth analysis. For Deviant Moon Tarot we asked Patrick Valenza to give readers a glimpse of what went into the creation of his enigmatic deck. The result is a gorgeous coffee table type of book full of amazing artwork and fascinating stories. The other book that we are publishing is a Chrysalis Tarot companion. The author Toney Brooks takes us on a journey of self-discovery through the tarot. I so admire his ability to write about profoundly insightful spiritual ideas and make them completely accessible and relevant. The book also features some new sketches by Holly Sierra. I am very excited about both these books! TR: How many submissions does your company get in average of books, tarot, or oracles? LA: We usually get 8-12 submissions per year from new artists. TR: How do you or your company decides which ones to publish? LA: We evaluate potential new products primarily on the basis of the artwork. We look for well-executed, fine art. We do work with some very talented digital artists (like Patrick Valenza and Ciro Marchetti) but also a number of talented painters. We look for fresh, original ideas and themes that will enhance the tarot or oracle reading experience. We sometimes approach artists who have not done a deck before but whose style we feel would be a natural fit to create a tarot or oracle deck. It’s very gratifying to discover new talent. TR: How do you decide when to publish the ones that you do choose? LA: We like to have new decks published throughout the year but it’s important to launch new products at tradeshows like at INATS (International New Age Trade Show) so we can see firsthand the reactions of customers to our new decks. There’s quite a process involved that leads to the publication. Once we have all the art and written materials, the project goes through editorial, production and design stages, which are all very collaborative. Our art department works very closely with the artists and authors to bring their vision to fruition. TR: I know that your company publishes several different areas of interest, which is your favorite ones that your company publishes? LA: We publish interesting games and playing card decks, many with historical themes. I certainly have fun working on those projects. But I have discovered a real passion for tarot, oracle decks, and inspirational decks. I love hearing about how our decks inspire people and help them deal with challenges in their lives. What could be more fulfilling than that? TR: Is there something that you wish you could publish? Or is there something that you wish your company was the one that did publish it? LA: The Housewives Tarot is such a cute and clever deck, it must have been a lot of fun to create! At the other end of the spectrum, a tarot artist that I greatly admire is Yoshitaka Amano, perhaps because I am drawn to Asian art and culture. TR: What is the process for someone who's wanting to get their deck or book published? How long does this process take? LA: If someone wants to have U.S. Games consider his or her deck for publication we ask for a proposal identifying what the project is and what distinguishes it, what makes it special? We like to see samples of the artwork. If it’s a tarot deck, we like to see at least 3-4 Majors and 3-4 Minors. I also like to see a sample of the writing. When these things are submitted, they are reviewed by our New Product Committee, which has people from our Art Department, Management and Marketing teams. In a few cases an artist publishes a limited edition deck and then we publish the U.S. Games version. TR: What advice would you give any of our readers if they were looking to get an book or deck published? LS: Creating a 78-card tarot deck is a tremendous challenge. It’s important that the style you create is consistent throughout the Majors and the Minors, and that the Minors are fully pictorial. It’s also important that the artwork is something that other people can relate to, whether it’s a tarot deck or an oracle deck. But remember everything starts with an idea and a dream.